All Ksport Airtech Systems feature high quality air bags, proven to handle the stress and abuse of daily driving as well as drift circuit use. Take advantage of the near infinite adjustability thanks to the adjustable lower mount, 36 levels of damping adjustment, and the unmatched height adjustability (0-120/200mm depending on vehicle) of air suspension. These air suspension kits are designed for easy bolt-on installation. No modifications to OEM shock absorbers or OEM top mounts are required. Vehicle may need to be modified for air line routing. All Ksport Airtech Systems use VIAIR compressors, and can be raised from the lowest setting to max height in as little as 2 seconds*. All Hoses, wiring, and installation manuals are included. Our Executive system has all the features of the Pro Plus kit but adds 4 height sensors that constantly monitor each corner of your vehicle and auto level the ride height while driving. No switches or gauges are needed with this kit and no complex wiring is involved. Instead the kit is operated off a single OLED color screen remote control. The remote displays air tank pressure and front/rear left/right air bag pressure. Four user presets can be saved so you can have quick access to changing your ride height on the fly. 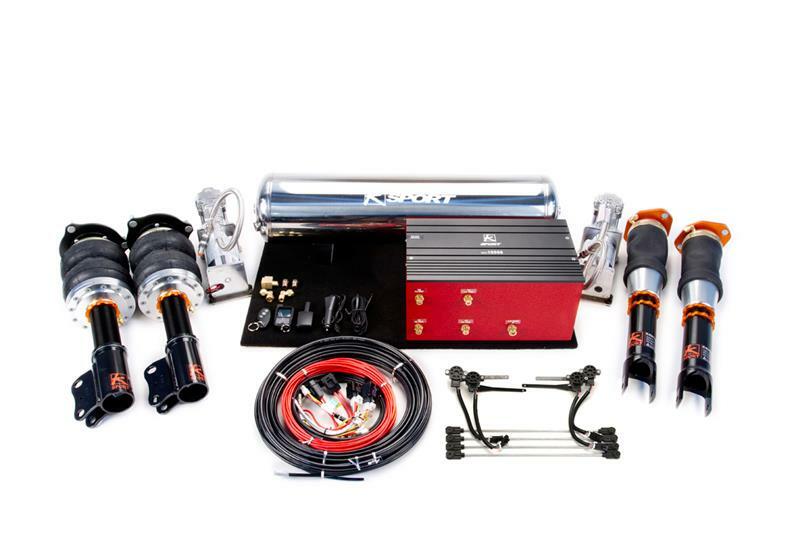 The Executive kit offers 4 way adjustability where you can adjust front/rear left/right independently. The system will also auto level during driving using the included height sensors. Memory for engine start will automatically set the ride height you choose. The remote can be charged via standard mini USB and we even include a convenient car charger. Our seamless installation control box is standard along with a single Viair 444c compressor (a 2nd compressor can be added for an additional cost). A polished lightweight 5 gallon air tank is another welcomed upgrade from our Basic and Deluxe kits. A standard 4 button remote control is also included as a backup in case the battery dies on the OLED remote. Professional installation is recommended. *Airtech Pro Plus and Executive will raise your vehicle in 2-5 seconds. Basic and deluxe require 4-7 seconds.